Researchers from Nanotek Instruments have developed a new graphene-based supercapacitor that can store as much energy as NiMH batteries, but charge and discharge in minutes or even seconds. The new device has a specific energy density of 85.6 Wh/kg at room temperature and 136 Wh/kg at 80 °C. 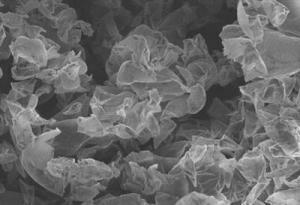 These are the highest ever values for "electric double layer" supercapacitors based on carbon nanomaterials. The new supercapcitor has electrodes made of graphene mixed with 5wt% Super P (an acetylene black that acts as a conductive additive) and 10wt% PTFE binder. A sheet of carbon just one atom thick, graphene is a very good electrical conductor as well as being extremely strong and flexible. The problem with single-layer Graphene sheets, according to the team, is that they tend to re-stack together. They are trying to overcome this problem by developing a strategy that prevents the graphene sheets from sticking to each other face-to-face. This can be achieved if curved graphene sheets are used instead of flat ones.